Refrigerant leaks are one of the most common problems in the air conditioner which result in improper functioning of the air conditioner. If there is a Freon or refrigerant than adding refrigerant is not the solution to the problem. It is the job of the HVAC professional to fix the Freon leak. He will fins the place of leak fix the leak and then charge the unit. 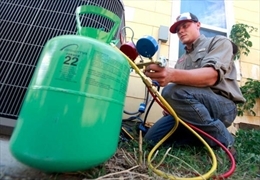 The performance of your air conditioner is depended on refrigerant charge too. Repairing cost of the refrigerant leak depends upon the place of the leak. If the leak is in the tough spot it can cost up to $1000 to repair the leak. Repairing of the leak can include detective work, replacing the coil, replacing the Freon and recharging. Only Adding a refrigerant tot the system can cost Only Adding a refrigerant tot the system can cost $40 to $175 R22 refrigerant is more expensive than other refrigerants. Repairing of the leak and recharging the refrigerant costs more than 500$. 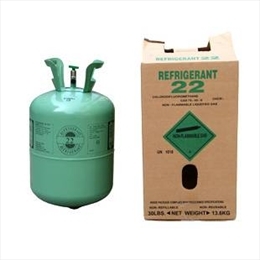 R22 refrigerant costs more than other types of refrigerants. Sometimes a leak in the system can be as expensive as buying a new unit. Expense incurred on repairing the refrigerant leak and recharging the unit with R22 refrigerant equals the expense of buying new AC unit. Low refrigerant causes the damage to the compressor of your unit it can even cost your compressor to fail. Changing the compressor can cause 2000$. However proper and regular maintenance of your HVAC unit can help you avoid this problem and can save large amount of money.